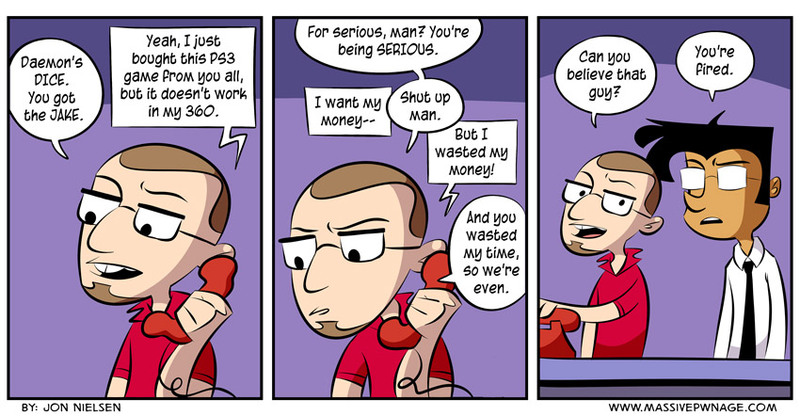 I had a friend who worked at Gamestop for a while and this is something he talked about once. Anyone who’s worked in customer service knows it’s fun to make jokes, but there’s no way you’d keep your job if you actually acted that way. Not the jobs I’ve worked at least! This entry was posted on Wednesday, November 13th, 2013 at 12:00 am and is filed under Comics. You can follow any responses to this entry through the RSS 2.0 feed. Both comments and pings are currently closed. Haha, yeah, Currently work customer service in a call center. Some people, dont get me wrong most of em are much better than I experienced, but sometimes I just wish I could hang up on some people. Not my fault you did not read. My GF used to work at Gamestop, and this was pretty much her every day. I never really got tired of listening to the “special” requests people made when it came to their own stupidity.